El Sistema : A visionary global movement that transforms the lives of children through music. A new model for social change. May 29, 2018 /0 Comments/in The power of attention and meditation, The role of Great Art. 33 years ago in a parking garage in Caracas, Dr. José Antonio Abreu gathered together 11 children to play music. El Sistema was born. 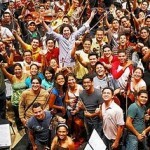 It now teaches music to 300,000 of Venezuela’s poorest children, demonstrating the power of ensemble music to dramatically change the life trajectory of hundreds of thousands of a nation’s youth while transforming the communities around them. The first initiative of El Sistema USA is a one-year postgraduate certificate program for accomplished young musicians and music educators who desire to become ambassadors of El Sistema and who are committed to developing the music education miracle outside of Venezuela. Housed at New England Conservatory, Abreu Fellows will spend a year studying between Boston and Caracas, and leave with the tools to return to their communities to implement the El Sistema model. The curriculum, teacher training materials and documentation of the Abreu Fellows Program will be freely available on ElSistemaUSA.org as a resource for all to support local El Sistema programs being developed around the country and internationally. 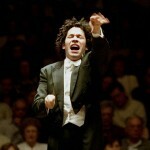 Tags: buddhhism and music, Gustavo Dudamel, mystical ecstasy. https://blog.meditation-presence.com/wp-content/uploads/2017/09/bandeauaccueil.jpg 0 0 vidji https://blog.meditation-presence.com/wp-content/uploads/2017/09/bandeauaccueil.jpg vidji2018-05-29 13:57:512018-05-29 13:57:51El Sistema : A visionary global movement that transforms the lives of children through music. A new model for social change.